Kamusta kayo sa first page 'ko! Hope you enjoy my gibberish. 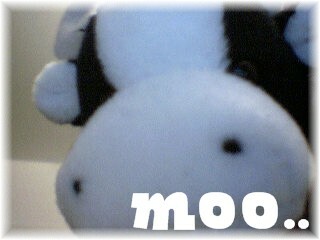 This is my fave stuffy, Moo-Cow." Hello there! I'm but a child -- at heart -- and wished to continue writing in an online journal ever since XANGA had a little problem, and ever since I wondered how people created their sites so graphically and very creatively. I guess that's just how this all began. Well, that and my undying passion to write. Feel free to browse around and visit some of my other pages on the left hand side <~~ my menus page. I hope you enjoy my little diary and wish to hear from any of you who've visited. Thanks For Coming!